Since I first bought this Humvee from Spectre Miniatures its gone through a bit of work. Originally representing an interim model from some point in the War in Afghanistan, I’ve stripped it down to an earlier variant, then rebuilt it into one in service with the Ukrainian Airborne forces. I covered my first impressions of Spectre’s Humvee in an earlier post. The model was perfectly workable for my purposes, where I wound up stripping off parts of the detail to better represent the particular model which the Ukrainians used as a base for their own vehicles. Ukraine’s Humvee is distinct from your regular Humvee variants in the design of its roof. Raised up, presumably to allow the crew to view out of the periscopes once they button down the hatches and firing ports on the windows. Similarly, the placement of the turret cupola is further back than normal – sitting behind the rear seats in what would usually be a cargo compartment (this area is also only accessible from the interior, as opposed to having the typical rear door). Whilst I can’t speak for the protection that these additional plates provide, they may be there for the vehicle to be better suited for colder climates than the base model (whether they forked out for a heater is another question). When I’d first made a model representing one of these variants I’d created it in the style of Ukraine’s forces in Kosovo (KFOR). With a brown/ black/ green camo scheme and large KFOR insignia. The situation in Ukraine has changed since then however and they’ve drastically scaled down their forces abroad, with the camo scheme transitioning to a matte green or more field applied camos, and the insignia replaced by invasion stripes. 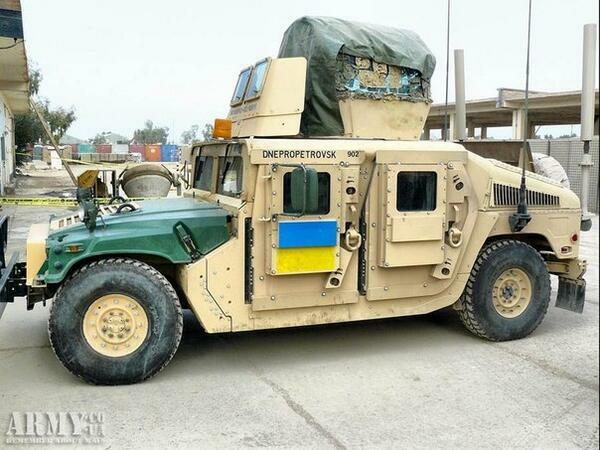 As the war in Ukraine’s progressed, these existing Humvees have been supplemented by further deliveries from America. These newer Humvees were delivered in a mix of cargo and armoured variants fresh from the Middle East. 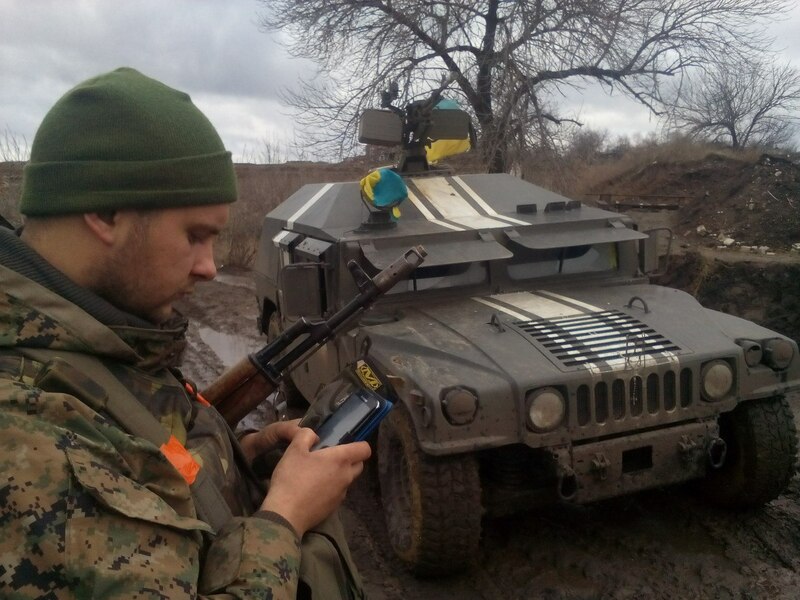 At first Ukraine just added DShK machine guns to their turrets and put them into service. Tan camo and all. However, later they’d convert them to resemble their older indigenous variant, though with a variance in the professionalism in their design, ranging from clear replicas to a box bolted onto the cargo bay (though admittedly, with more firepower, armed with twin DShK rather than the original NSV). Personally though, their first design has a bit more flair to me, so having already built one years ago, that’s what I decided to build with Spectre’s Humvee. Potentially, should another Humvee kit come along, then I’ll make one of these newer variants (because I can’t say no two those twin DShKs…). With Spectre’s kit there was a bit of work to do to bring it in line with the base model which the Ukrainians used to develop theirs on. I sanded down a bunch of the lower skirting (where most of the mould defects happened to be) and rebuilt them in the style of this older variant. Not all areas were redone appropriately, with the front windshield remaining in the original style –rather than the more basic one the Ukrainians have-, as its fairly obscured. Most of the bits are either plasticard or clay. I took some antenna mounts(the wrong type, but from experience with my other attempt, these tend to break off fast) and a spare wheel from one of Spectre’s Humvee Upgrade kits. The NSV was left spare when I built my T-72 Terminator. Whilst the details aren’t all perfect, and some are overly large (like the bolts), it gives enough of an impression of the real thing. 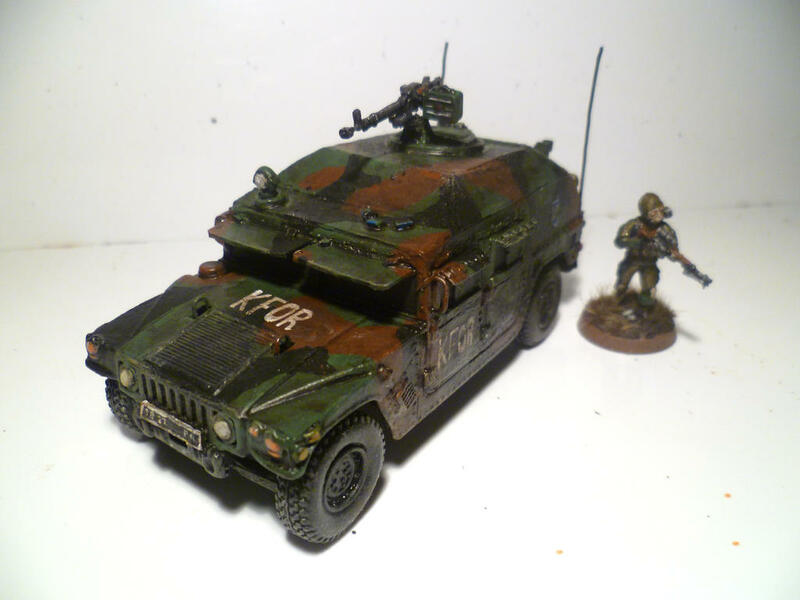 When it came to painting I went for a more basic scheme than the camo which I’d used on my first Humvee. This was done with Vallejo US Dark Green over Games Workshop’s Caliban Green with a Vallejo Russian Uniform WWII highlight. Which seems to work for your generic looking Soviet green (though of course the colour of these Eastern European vehicles vary so much in their tones, that even if its not an exact match, its close enough). This is the same method which I’ve been using for most of my recent vehicles, and is quick enough to do – with the weathering covering up any mistakes. I then liberally covered the vehicle in mud. Being a mix of various Games Workshop browns and tan paints (my paint collection is mostly different brown paints…). This was added to with a sand/ water effects / brown- grey paint mix to simulate thicker mud deposits on the underside of the vehicle. Overall though the underlying vehicle’s paint job isn’t quite as scarred as the others in my collection (none of the Humvee’s I’ve seen pictured looked that worse for wear), but with all the mud that’s perhaps moot. 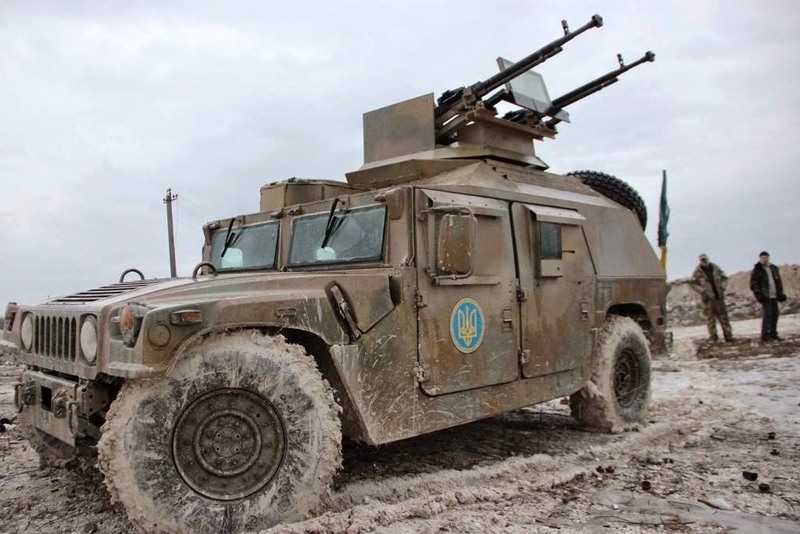 Ukraine’s Humvee’s perhaps a bit of an odd duck among Humvee variants, with its distinctively angled roof and inclusion of Soviet standard weaponry and attachments rather than the usual NATO ones. With the war progressing we’re likely to see this sort of vehicle declining in number compared to the newer Humvee models and more suitable armoured carriers (like Ukraine’s extensive inventory of Iveco produced armoured cars). Still, this one remains one of those vehicles which suit the flavour of that conflict, something foreign or old converted for the current situation. With the current state of affairs in Ukraine this one would work suitably with most of the miniatures in my collection. Either with modernized forces like my Spetsnaz (though I don’t think the internal security forces I’ve modelled are uses these), some ad-hoc looking militia unit (or rather a sorry looking airborne squad) or even the Separatists – now being used under a different banner (though they ought to remove those invasion stripes quick). Should I pick another one then I’d have a decent enough patrol force (as I’ve seen these deployed). As in reality most of the modern games that I’ve played are on the small scale, squad on squad. Where the thin armour and relatively lightly armed load out (as I eye up my BMP-3s) shouldn’t influence the tide of battle too much if the other side has any RPGs or Heavy Machine Guns inventory. Fantastic work. I can barely cut in a straight line so that level of conversion is very impressive.